Labrum increases the stability of hip, increases the surface area for weight bearing and provides proprioception. It increases stability by deepening the acetabulum and also by acting as a seal to maintain negative intra-articular pressure. Acetabular labral tears are associated with capsular laxity, femoro-acetabular impingement (FAI), acetabular dysplasia and chondral lesions. They are seen in 90% of patients with mechanical hip symptoms on arthroscopy. The cause of labral tears is not clearly defined, but femoroacetabular impingement is the predominant cause in nondysplastic hips. Impingement may result from abnormal transition between femur head and neck, overgrowth of bony acetabulum, acetabular retroversion or a combination of these abnormalities. Hip joint capsule is reinforced inferiorly by the pubofemoral ligament, posteriorly by the ischiofemoral ligament and anteriorly by the iliofemoral ligament. They tighten in extension and relax in flexion. Iliofemoral ligament tightens in external rotation and adduction, pubofemoral ligament in external rotation and abduction and ischiofemoral ligament in internal rotation and abduction. Ligamentum teres runs from the acetabular notch to the fovea capitis of femur. it tighens in flexion, adduction and internal rotation. Labral traumatic tears occur due to shearing forces generated during pivoting, twisting and falling. In Asians, tears are most commonly located posteriorly and occur due to hyperflexion or squatting. In North American population, tears are most commonly located in the anterosuperior aspect and occur due to pivoting and twisting. Labral tears can lead to capsular laxity and abnormal motion which in turn can lead to labral fraying and chondral degeneration. Femoroacetabular impingement (FAI) occurs when there is reduced clearance between the acetabulum and the femoral head. There are two types, cam type and pincer type. Cam type occurs when the diameter of the femoral head is abnormally large and the normal spherical transition between femur head and neck is abnormal leading to impingement between femur head and acetabular rim particularly during adduction and internal rotation. Cam impingement leads to anterosuperior labral and chondral lesions. Pincer impingement occurs when the coverage of femur head by acetabulum is excessive. There are two types of overcoverage; coxa profunda with generalised coverage and local anterior due to acetabular retroversion which results in contre-coup posteroinferior chondral lesions. Pincer impingement is more common in middle aged females and cam impingement is more common in young athletic males. FAI can lead to labral lesions, chondral lesions and progressive degenerative changes leading to osteoarthritis. Hip capsule laxity is a recently recognised pathology. It can either be generalised due to disorders like Marfan syndrome, Ehlers Danlos syndrome etc, it can be focal rotational most commonly due to forceful external rotation leading to iliofemoral ligament insufficiency. Labral tear may also cause capsular laxity. Lesions of ligamentum teres are the third most common lesion found on arthroscopy in athletes. Developmental dysplasia of hip is associated with shallow acetabular socket. This leads to reduced anterior and superior coverage. This leads to excessive dependence on the anterior capsule which may lead to hypermobility and labral tears. Labral tears may also be due to Perthes disease or slipped capital femoral epiphysis. Discontinuity in the peripheral rim of labrum is called radial flaps and they are the most common. Fraying of free rim called radial fibrillated tear is seen with degenerative changes. Longitudinal tears are the least common. Labral tears are most common in the anterior and anterosuperior area. Patients may present with pain mainly in the groin, clicking, locking, giving way and stiffness. Inguinal clicking is associated with high incidence of labral tears. Clicking due to labral tears are more often felt during internal and external rotation of hip, in contrast to clicking during flexion seen in extra-articular causes of snapping hip. Clinical examination should include tests to detect signs of generalised ligament laxity, assessment of range of movement, tests to detect intra-articular pathology, capsular laxity and impingement tests. Tests for intra-articular lesions include FABER test, scour test and Stinchfield test (resisted SLR test). Test for generalised ligamentous laxity. Tests to assess generalised ligament laxity utilises Bird criteria or Beighton criteria(elbow and knee hyperextension, thumb opposition, hyperextension of fifth metacarpophalangeal joint and ability to place the palm on the floor with knee in extension. FABER (Flexion Abduction External Rotation) test is done by moving the hip into flexion, abduction and external rotation and then pushing it into extension. Ask for the site of pain. Posteriorly felt pain is due to sacroiliac pathology and groin pain is due to hip disease. Scour test is done by moving the hip in an arc involving flexion-adduction and extension-abduction. During this movement apply axial load and rotate into external and internal rotation. Pain and limitation of movement suggest intra-articular pathology. Stinchfield test (Resisted SLR test) is done by asking the patient to actively flex the hip to 30 degrees while keeping the knee in extension and to hold the position. Apply resistance just proximal to the knee. Pain felt in the groin is suggestive of intra articular pathology. Anterior impingement test is assessed by forcing the hip into combined flexion, adduction and internal rotation. Posterior impingement test is assessed by bringing the patient to the distal edge of the table to allow maximum extension and then taking the hip to maximum combined extension and external rotation. Log roll test is done to assess hip joint capsule laxity. The hip is kept in neutral flexion-extension and neutral abduction-adduction and the limb is passively rolled into full internal and external rotation while assessing the range of movement and any associated pain and clicking. The most common causes of groin pain in athletes are hernia, adductor tendinopathy and labral tears. The best investigation to identify labral tears is Gadolinium enhanced magnetic resonance arthrography. 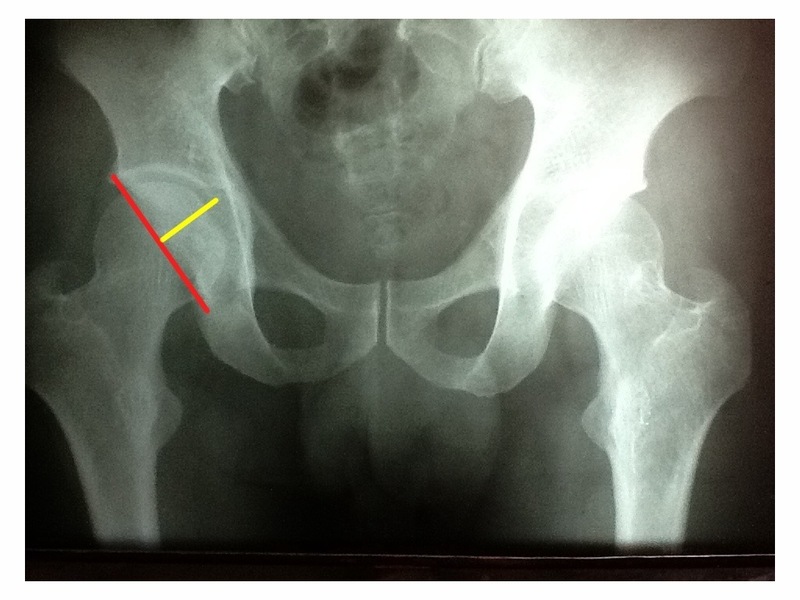 Radiological investigations should include anteroposterior and lateral views of the hip. Look for abnormalities suggestive of femoroacetabular impingement such as lack of head neck offset at the head neck junction, acetabular retroversion, osteophytes, and joint space narrowing suggestive of femoroacetabular impingement. Evaluate the following measurements on the x-ray. Mark the centre of femoral head on both sides, draw a horizontal line connecting them. Draw a vertical line perpendicular to this line from the centre of head. Draw an oblique line from the centre of femoral head to the lateral edge of acetabulum. Measure the angle between the vertical and oblique lines. Draw a line connecting the superolateral edge and the inferomedial edge of the acetabulum and measure. From this line draw a perpendicular line to the deepest part of acetabulum. Calculate the percentage of depth to the width. Identify the acetabular sourcil, which is the sclerotic eyebrow like line at the superolateral weight bearing dome of acetabulum. Draw a horizontal line at the medial end of sourcil. Draw another line connecting the lateral and medial ends of sourcil. Measure the angle between the two lines. Normal 10°. Seen in dysplasia. Draw 3 vertical lines. One at the most medial and another at the most lateral points of femoral head and measure the distance. Draw the third line at the lateral edge of acetabulum and measure the distance between the line at the lateral edge of acetabulum and lateral edge of femoral head. Express the lateral extrusion as a percentage of femoral head width or in millimetres. Draw two horizontal lines, one at the inferior end of tear drop and another at the most inferior part of femoral head and measure the distance between them. Draw a horizontal line connecting the inferior end of tear drop. Draw another line from inferior end of teardrop to the lateral end of acetabulum and measure the angle between these lines. –Intact line = curve was intact and continuous. Trace the anterior and posterior lips of the acetabulum from the superolateral edge of acetabulum downwards. Normally the acetabulum is anteverted; hence the posterior border is lateral to the anterior border. If acetabulum is retroverted; the anterior border crosses the posterior border producing a figure of 8 pattern (Crossover sign). Normally the centre of femoral head is lateral to the posterior wall of acetabulum. If it is medial then the posterior wall sign is positive and is suggestive of pincer type of impingement. Draw the long axis of the neck and head on the lateral view. Normally it is close to 0°. It will increase as the femoral neck’s width disproportionately increases in the superior portion of the neck, seen in cam type of impingement due to abnormal head neck transition. A careful evaluation of the x-ray and other imaging modalities should be done before treatment. Look for any signs of impingement on the x-ray. Look carefully for acetabular retroversion. Look for signs of osteoarthritis. Carefully study the MRI for any chondral or labral lesions. Chondral and labral lesions indicate poor prognosis for treatment methods that address labral lesions alone. Severe acetabular retroversion should be corrected by periacetabular osteotomy in addition to treatment of labral lesions. In presence of impingement, identify the type of impingement whether cam, pincer or combined. Cam type impingement is treated by safe surgical dislocation described by Rienhard Ganz and open femoral osteochondroplasty. Osteochondroplasty removes the abnormal bone that is present at the femur head neck transition zone. It can also be done by hip arthroscopy. Pincer type impingement is corrected by safe surgical dislocation of hip and debridement of the acetabular rim. Associated chondral lesions are debrided and treated by microfracture if necessary. Labral lesions can either be debrided or repaired. Longitudinal tears are treated by suturing and abnormal capsular laxity can be addressed by thermal capsular shrinking or open imbrication. Prognosis is poor if the patient already has osteoarthritic changes or if there are extensive chondral lesions.